(Newser) – President Obama pushed African nations today to treat gays and lesbians equally under the law, a position that remains unpopular through much of the continent. Obama's Kenyan counterpart responded by calling the matter a "non-issue" for his country. 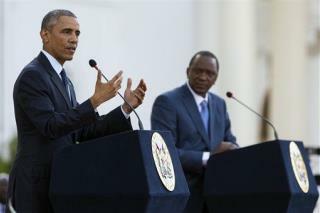 Obama tackled the sensitive matter on his first full day in Kenya, the country of his father's birth. He drew on his own background as an African-American, noting the slavery and segregation of the US past and saying he is "painfully aware of the history when people are treated differently under the law." Meanwhile, Obama dare not show his face in Texas, Baltimore, New York, California, Arizona, Florida and other hornets' nest of Killer Kops Klansmen, to tell those racist pigs to stop murdering Black people. Who the Fu*&^ is this dope, the new leader of the Gay community. They have many problems over there, namely survival and this stooge is discussing gay rights. It doesn't get much worse. What a frggin clown. Wait till your term ends, then you can become Jimmy Carter and save the worlds Gays.